Recently I made a short one-day trip to Malaysia! You know how troublesome it is to go around and look for data card or wifi right? And... how to survive a day without Twitter, Instagram and Facebook?! It's super handy for those last minute google searches too. at a flat rate of 15 Singapore dollars per day (includes GST). No need to install any software and you can connect up to 5 WiFi-enabled devices at the same time! If you are concerned about losing any of the equipment, you can purchase insurance at S$3 per day which covers the theft, loss or accidental damage of the Telecom Square mobile Wi-Fi router unit. With the insurance, you only pay 30% of the unit price in the event of theft, loss or accidental damage. The insurance does not cover the spare battery though. Note: Remember to place your order online 3days prior to your departure date. Next, collect it on the day of departure at the following Changi Airport booths! They are at the Changi Recommendations booth, light blue and white in color. you can opt for delivery service. They will ship the portable Wi-Fi to your designated address one business day prior to your departure date by city courier at S$6/unit. There is also an option for two way city courier at $12/unit, meaning they will deliver it to your place before your departure date and they will collect it at your place after your arrival date. After your trip, all you have to do is to return them to the Changi Airport booth. 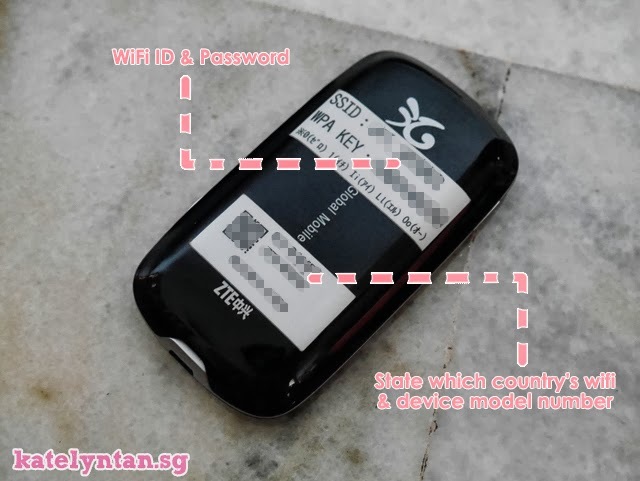 Customers will be provided with a carrying case, USB charger, micro-USB to USB cable wire (connected to the USB charger), international adaptors, portable Wi-Fi router and a user quick guide as shown in the photo above. The device is really easy to use. All you have to do is to press and hold the Power button of the Wi-Fi router till the screen lights up. Then wait for the device will search for the local telco mobile broadband and pick up a signal. The Wi-Fi hotspot name (SSID) and password can be found on the back of the mobile Wi-Fi router. You can connect up to 5 different devices onto the mobile Wi-Fi router. So if you think about it, 5 people share one device, that is only $3 per day per person! SSID and WPA Key are both stated on the back of your device. Note: Remember to set your smartphones to Airplane Mode before the plane takes off! You can sleep on the plane, eat on the plan, etc. Just don't use your data on the plane. I believe all of you will not want to come back home to a mad expensive phone bill. The battery life of the portable Wi-Fi router can last for about 3-4 hours of continuous usage. I would receommend you to rent a spare battery or bring your portable charger (power bank) along. Alternatively, you can always switch it off when not in use. I think the pricing of Telecom Square Mobile Wi-Fi Router Internet Services is reasonable. They cover many countries worldwide and it's really easy to rent/return. especially for those with odd hour flights, as not many phone shops (even in the airport) open 24/7. Then the moment you leave the airport, you might not be able to find a phone shop easily. Another benefit of using their service is that you still can have your SG sim card in your phone. You will not have to worry if people will be calling your SG number, etc. You can have your SG sim card in your phone. All you have to do is to off data and on Wi-Fi. Hope it's useful for those who are traveling overseas!